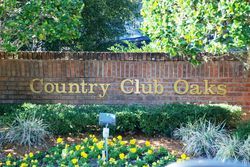 Country Club Oaks is located off Country Club north of Lake Mary Boulevard. There are approximately 57 homes in the community. A park-like common area with a pond, fountain and benches is centered in the community. Mayfair Country Club is less than ½ mile away and Lake Mary Sports Complex is less than ¼ mile away. Shopping and restaurants are close by on Lake Mary Boulevard, Heathrow’s Colonial Town Park and Park Place and Seminole Town Mall. Commuters can easily access I-4 from SR 46A or Lake Mary Boulevard as well as Rt 417 and Rt.17-92.